Bacteria, viruses and other pathogens thrive in the water around us. Because the membranes which protect these microbes are constructed with carbon-chain molecules, they are a prime target for the free-radicals produced from ozone. 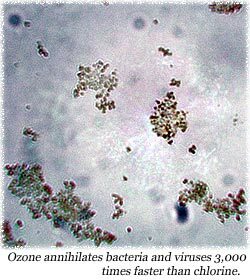 Ozone attacks the microorganisms like a shotgun, bursting their membranes and spilling their contents. The destruction is virtually instant. Ozone annihilates bacteria and viruses 3,000 times faster than chlorine. 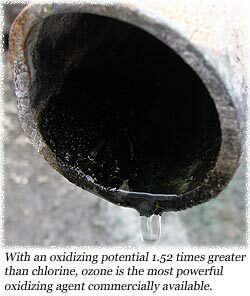 Ozone has the oxidizing strength to kill hardened microbes that survive chlorine assault. Cryptosporidium parvum is one of the more resilient water-borne pathogens. Studies have shown that after 18 minutes, Cryptosporidium was still alive in water containing 350,000 ppm of chlorine. 700,000 ppm of chlorine was required to instantly kill the cysts. The same study proved that only 1 ppm of ozone was effective in instantly killing the same Cryptosporidium cysts. Black Water, Rust, Rotten Eggs? Anyone who has choked down a glass of raw well water is familiar with the sickening tasted of sulfur. And those who have scrubbed rusty and blackened stains from sinks and bathtubs know the frustrations of iron and manganese problems. These troublesome minerals are found in heavy concentrations in ground water throughout the United States. They can wreak havoc on your clothes, your appliances and your health. With an oxidizing potential 1.52 times greater than chlorine, ozone is the most powerful oxidizing agent commercially available. When injected into the water, ozone will instantly oxidize these suspended elements, producing insoluble compounds which can then be filtered from the water. Millions of dollars are spent each years replacing fouled water systems due to iron, manganese and iron bacteria. With ozone, the result is refreshingly clean and chemical-free water. It has become more and more difficult to create safe water from increasingly contaminated water sources. As the volume of chemical pollutants in our water and wastewater increases, the EPA has employed tough regulations in an attempt to reverse the contamination of U. S. lakes, rivers and aquifers as well as people. Modern water and wastewater facility operators are struggling to find a solution as conventional treatment methods have fallen short of the new standards. With the enactment of the newest Disinfection Byproducts Rule (DBPR), that solution has become more difficult to design. Progressively, more engineers are turning to ozone as the only viable option. Ozone has proven a successful weapon in the destruction of toxins such as pesticides, ammonia and even lethal poisons such as cyanide. A recent study demonstrated ozone is effective in destroying lethal hepatoxins and neurotoxins (Rositano, Nicholson, Pieronne, 1998). The study went on to show that chlorine, at 10 times the concentration of ozone, could only destroy 75% of the neurotoxins. 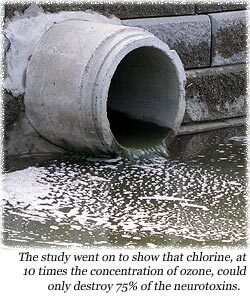 Amazingly, ozone is more effective than chlorine, yet leaves no toxic residue in the water. Ozone is helping facilities exceed the EPA standards for THMs and HAAs.